In Windows we can distinguish the folders by changing its name, sorting or changing folder icons. But the folder color always in yellow color, we cannot change that and it makes the difficulty to finding a particular folder. Do you want to organize your windows folders with a different color? There is a solution available for this problem called Rainbow Folders. 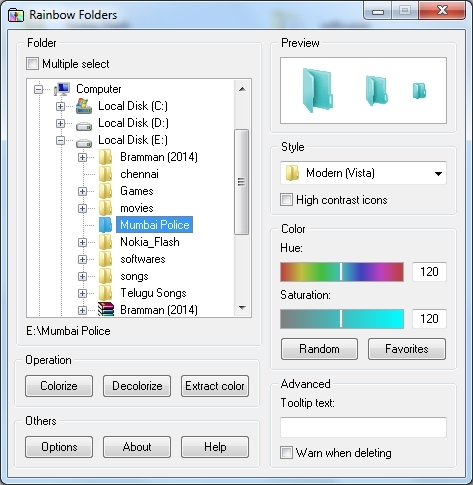 Rainbow Folders helps you to change colors of your desired folder anywhere in Windows system. It supports different icon styles including classical, typical and modern. You can set the colors by adjusting hue and saturation bars. You can also change the color of multiple folders by selecting the Multiple select button. After your selection, click on "Colorize" button to color the folders or if you want to remove color, click on "Decolorize" button to remove color on folders. Download the file and extract it first and install the software. Then you can access this software from right click of the folders from the explorer window. Rainbow Folders is a very useful, and easy to use software to color your folders in Windows.